In other words, left-sided heart failure. The numbering a,b,c indicates the way the conditions relate to the death, and should always be read "backwards". So - Arterial sclerosis caused Myocardial degeneration, which in turn led to left ventricular failure, which was the actual cause of death. Not the answer you're looking for? Browse other questions tagged palaeography death-records cause-of-death or ask your own question. Is it crass to record cause of death? What about for suicide? What does it mean if cause of death is listed as “Insanity” in late 1800s? 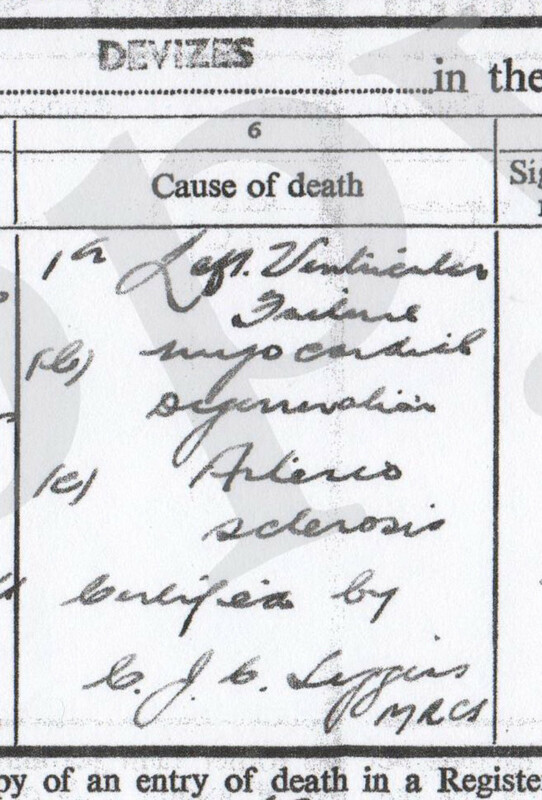 Determining cause of death in France in 1908? Is “Incain” an old spelling of insane? Does Cause of death being Convulsions suggest Cholera?